Display with elegance and pride. Want to protect your gun or blade in a locked case, but don’t want to ever let it leave your sight? 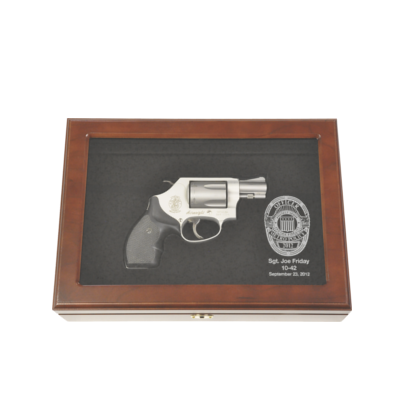 We offer a great line of cherrywood cases that feature a glass lid, providing the perfect solution for displaying all of your most prized arms. Every box comes with its own lock and key, and the interior is lined with soft RichVel fabric, the color of which you may chose. Depending on the size of the item you would like a case for, we offer 3 different boxes, GB12G, GB14G, and GB16G, which are shown above respectively. Want more? If none of these stock boxes fit your preferences, check out our 3 stock solid lid boxes or head over to our Customization page to see what we can do for you.